Virgilio Marquina and other protesters rally together outside the office of U.S. Sen. Marco Rubio on December 10, 2012 in Doral, Florida. Recent and near-retirees, the first major cohort of the 401(k) era, do not have nearly enough in retirement savings to even come close to maintaining their current lifestyles. Frankly, that’s an optimistic way of putting it. Let me be alarmist for a moment, because the fact is the numbers are truly alarming. We should be worried that large numbers of people nearing retirement will be unable to keep their homes or continue to pay their rent. According to the Center for Retirement Research at Boston College, the median household retirement account balance in 2010 for workers between the ages of 55-64 was just $120,000. For people expecting to retire at around age 65, and to live for another 15 years or more, this will provide for only a trivial supplement to Social Security benefits. And that’s for people who actually have a retirement account of some kind. A third of households do not. For these people, their sole retirement income, aside from potential aid from friends and family, comes from Social Security, for which the current average monthly benefit is $1,230. There are good proposals out there for improving the private aspect of our retirement system. Having employer-based 401(k) contributions be opt-out rather than opt-in is one such proposal. There are other commendable suggestions for ways to simplify personal financial management. But none of these ideas will help people who are nearing retirement. Only the possibility of several decades of compound returns make the personal financing of retirement a realistic idea for most people; those with only a few working years left cannot benefit from this. Absent an unexpected windfall, such as lottery winnings or inheritances, most 60-year-olds lack any capacity to significantly increase their savings. Even if we do find ways to improve the framework for self-funding retirement, how, exactly, do we expect younger workers, who might benefit from these improvements, to start saving significantly for their retirement? Soaring tuition and fees at universities, combined with the associated soaring student loan borrowing, have led many people to start their working lives already deeply in debt. According to theProject on Student Debt, the members of the class of 2011 with student loans had an average of $26,000 outstanding. These are mostly 22-year-olds who have never worked full time and who are finding it difficult to find good jobs in the age of the Great Recession. They’re beginning their working lives in the hole. Understandably, and necessarily, retiring that debt is going to be a priority over retirement savings. One might imagine that saving for a mortgage down payment and even spending a few bucks to enjoy life might be priorities too. At the very minimum, beginning their personal retirement savings will be delayed by years. People who go beyond undergraduate education and go on to graduate or professional schools can find themselves even more deeply in debt. The cost of law school is prohibitive for most. Many graduates effectively find themselves with a mortgage-sized debt but without the house. Those who, for whatever reason, did not choose to further their studies might lack the large levels of debt, but they also generally lack the opportunities to obtain jobs with decent wages and benefits, or any benefits at all. If the consensus is that we need policies in place to ensure that the vast majority of people have at least a comfortable retirement, then we need to adjust our current failing policies. Expecting people to save sufficiently for their retirement, even if those savings are subsidized by our tax code, is unrealistic. The 401(k) experiment has been a disaster, a disaster which threatens to doom millions to economic misery during the later years of their lives. Proposals to improve our system of private retirement savings — even good ones — will offer little to no help for the baby boomers who are currently nearing retirement, and are also unlikely to be of sufficient help for current younger workers. 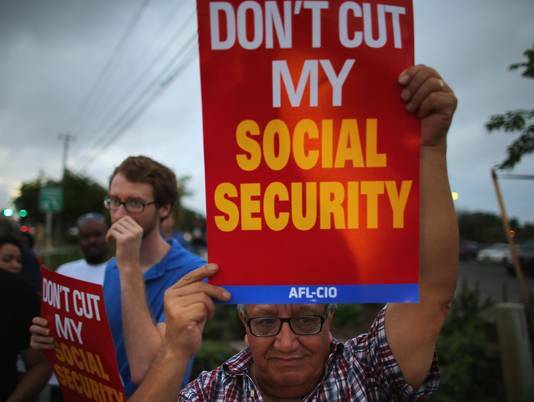 We need to increase Social Security benefits, now and in the future. It’s the only realistic way to provide people with guaranteed economic security and comfort post-retirement.